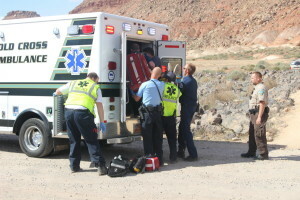 ST. GEORGE – A teen was taken to the hospital Monday following a bicycle crash on the Bear Claw Poppy Trail. The St. George Fire Department and other emergency responders were sent to the entrance of the popular trail located just beyond Navajo Road in Bloomington around 3:20 p.m., St. George Fire Battalion Chief Darren Imlay said. Emergency responders were sent to the Bear Claw Poppy Trail after a 15-year-old wrecked his bike on the trail. The force of the wreck damaged the teen’s helmet and he was transported to the hospital, St. George, Utah, March 28, 2016 | Photo by Mori Kessler, St.
A 15-year-old boy had been out riding with friends when he wrecked his bike about 150 yards from the entrance to the trail. St. George firefighters and medical personnel from Gold Cross Ambulance strapped the boy to a backboard and carried him out to a waiting ambulance. The teen was wearing a helmet while on the trail, Imlay said, adding that it had received some visible damage from the force of the crash. Life Flight was called to the scene, but was subsequently dismissed because the accident occurred near a road where an ambulance was located. The teen was transported to Dixie Regional Medical Center. Cyclists at the Bear Claw Poppy trailhead said it appeared the boy did not navigate a jump well, or he may have been blown over by the winds whipping through the area at the time. Personnel from the Bureau of Land Management, St. George Police Department and Washington County Sheriff also responded to the scene.